In our Christian faith, we're either drawing closer to God and to His purposes for our lives or drawing further away. Like an athlete in training, "there can be no middle ground." Steve Wisniewski spent thirteen seasons playing offensive guard for the Oakland Raiders. Considered one of the NFL's "dirtiest players," Steve was aggressive and tenacious, proudly wearing the silver and black. But everything changed when his eyes were opened to the importance of following God's call for his life. 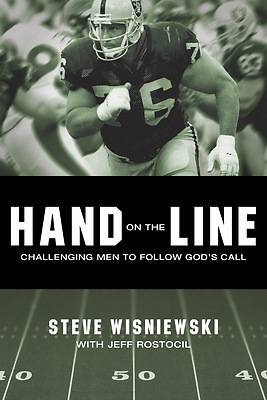 In "Hand on the Line," Steve transparently shares his powerful story that will encourage you on the journey to becoming a Godly man. If God could heal Steve's past, transform his present, and direct his future, the same God can accomplish amazing things through "you"